For those guys that hate shaving (yes, I have my hand raised! ), using a men’s electric razor is the best solution. Panasonic has long been the leader in making the best men’s grooming tools and that includes best Panasonic electric shavers. At the top of the list are their electric foil shavers or best Panasonic electric shavers. So, what makes Panasonic the leader in electric shavers for men (and women, too, but we are focusing on men for this one!)? Let’s take a deep dive into the world of men’s electric shaver reviews and see which one tops the list for being the best. Before we get into that I should tell you the one I use for myself is the Panasonic Arc5 Electric Razor from Amazon.com. I have sensitive skin and used to hate using electric shavers until I tried this one. For my needs, it works wonders and makes my life easy. Before I get into the best Panasonic electric shavers product reviews, let me take some time to explain how to use an electric shaver and some other information you need to know before you go out and buy one. Best results come when you use the right one for the job. If you have sensitive skin, you will need one that doesn’t irritate. If you have a thick beard, you need a powerful motor. If you are using the electric shaver for your head, then that makes a difference. 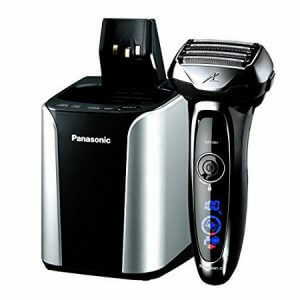 Start with the best Panasonic electric shavers reviews below to see which one fits your needs. Any grease or grime on your face will either make it hard to get a close shave, or gunk up your razor. Or both. 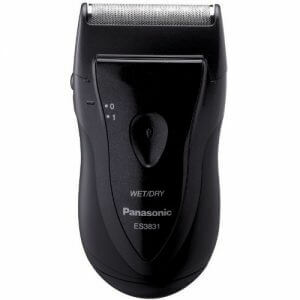 If you are using a Panasonic wet/dry shaver then you can wash it and shave right away. If not, make sure you dry your skin completely for best results. If your razor is not a wet dry version, it will not cut well. Hold the shaver at a 90° angle to your face and pull the skin taut. This will give you a smooth shave and reduce snags. Using a foil razor, you should just use up and down motions. The first week or two of using an electric shaver can be tough on the skin. It takes a little time for you to get the right technique and for the skin to get used to the electric razor. Using a wet/dry one usually takes less time for the skin to adapt since there is less drag which can be irritating at first. What’s the difference between a foil and rotary shaver, you ask? Let’s start with what a foil shaver is. A foil shaver has oscillating blades that move back and forth under the protection of a layer of foil with holes or slits in it. The foil protects the skin from getting cut by the blades while allowing the hair to pass through and get cut. A rotary head razor has blades that rotate below a circular head. There are slits in the metal disc that allow the hair to go inside and get cut just as the foil does.Rotary head razors have the ability to adjust to the contours of your face. So, is the foil razor or rotary razor better? It depends on your face and needs. Rotary razors are easier to use and can be a smooth experience. The thickness of the metal protective disc is rather thick so some models don’t get as close as a foil razor. Foil razors can generally get a closer shave, but can’t really follow the contours of the face. There are great models in either version, so it does depend on personal preference. I happen to think to get a close shave trumps all, so I think it is better to go with foil. Your priorities might be for rotary. To prevent drag and snags, there are 5 foil blades on the head. A pivoting head, I should add, so that it can really follow the contours of your face well. Both of those features make it ideal for guys with sensitive skin. It’s also the best electric wet/dry razor that Panasonic makes. When compared with other best Panasonic electric shavers, this one goes one step further, though. It also features an active shaving sensor. This automatically identifies what type of beard is being cut and adjusts the power accordingly. I used to have to press harder in those areas where my beard was thickest. Not anymore! The Arc 5 blades are angled at 30° so it takes the guesswork out of your hands about if you are cutting at the right angle or not. It can work as a wet/dry shaver, charges quickly in the charging base, is very quiet and the battery lasts 45 minutes. Most importantly, it gives a great irritation free shave for guys with sensitive skin. Yes, the Arc 4 has more blades and a more powerful motor and it’s one of the best Panasonic electric shavers. Why would I recommend a lesser electric shaver for tough beards? Because it actually works better. Four blades or more might seem better, and for sensitive skin that is the case. For thick beards, this does as good a job as the Arc 4 and costs less. Having a smaller head also means getting into tight areas well. The battery also lasts longer on this version, up to one hour compared to 45 minutes. It has the same pop up trimmer that can do some detailing work, or just buzz down the long beard hairs. Your beard should be properly trimmed before shaving, so this takes another tool out of the equation. The Japanese blade technology makes for a very smooth shave, even on the thickest beards. Use it wet or dry, but for very thick beards try a pre shave oil for electric shavers. There is a buffer under the blades that helps it follow the contours even though the head doesn’t pivot. I love to travel and my mantra is to travel as lightly as possible. This travel electric shaver is the best to stick to the travel minimalist mantra as you can get. And without sacrificing the quality of the shave. It is small, lightweight, but still packs a punch. In fact the motor is an 8,500 RPM, which is the same as the larger Arc 3. Yes, it only has one blade, but using Japanese blade technology it gives a very smooth and close shave. It is a wet/dry electric shaver and can be cleaned easily under running water. It’s ergonomic design fits well in the hand making it slip free if using it in a shower. Two AA batteries are used to power it, so either use rechargeable or bring a spare on the road and you will not be stuck without a razor. Battery life does depend on the quality of the batteries you buy, keep in mind. The shaver that’s one of our best Panasonic electric shavers comes with a plastic cover to go over the blade so it doesn’t get banged around or dented while on the road. It also serves to keep any hair from getting in your bag. It does also come with a travel pouch. In an ideal world every head would be perfectly smooth with no bumps. The reality is that our heads are not evenly shaped. The pivoting head of the Arc 4 makes it easy to get all over those contours of the head. It can pivot front to back and side to side to excellent coverage. The Nanotech razor blades are sharp and durable on any hair type. They even lift the hairs making sure the hair is cut at the base for a nice, smooth shave. The ergonomic design is comfortable to hold, even upside down when shaving your head. Use it wet or dry, in the shower or out. A pop up trimmer can keep your beard in line with where it meets your hairline, or simply use it as a beard trimmer, too. Battery life is good, which is even more important when shaving your head. You could probably get three head shaves before needing to recharge. The total battery life is around 45 minutes. Recharging takes an hour. How long it takes to shave your head depends on a few things, but with 14,000 cuts per minute, it should make quick work of it. This also reduces having to go over the same spot multiple times, avoiding irritation. 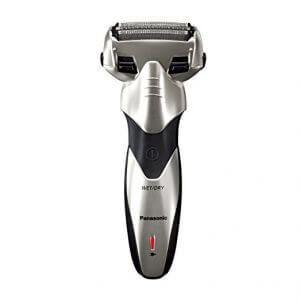 Are Panasonic Electric Razors worth It? Can you get a good shave with an electric shaver? With a different shaver for every type of beard or skin, there is an ideal razor for every guy out there. Which means, yes, you can get a great shave with an electric razor. Provided you do your homework and get the right one. I believe there is a tool for every job. With that in mind, Panasonic is the go-to company for the best wet/dry shaver, the best electric shaver for the head and more. This means that these best Panasonic electric shavers will never sit and collect dust under your bathroom sink. You will definitely get your money’s worth out of these razors by using them often. Not to mention that they last a long time. The Andis Cordless T-Outliner Review is Here!